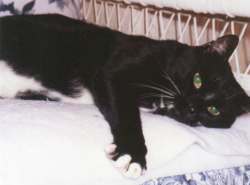 Star was trapped as a feral by Kitty Angel volunteer Carel, who kept him at her home rather than send him to the shelter -- he was a sorry looking, abandoned, hungry, mistreated kitty. After months of socialization, kindness and love Star has turned into a big love bug and has become a permanent member of the family (although he really hates his brother!). Pixie, Hershey and Tigger (1st, 2nd and 4th, left to right) were adopted by Wendy in 1997 - they were found as kittens living in a graveyard. They get along great with Nicky (3rd from left) and love the screened porch where they will sit all day watching the chipmunks, squirrels and birds. 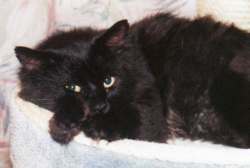 This is Buddy who was adopted by Robert and Leslia in 1998. His new parents say that he is settling in great! These two loveable cats are Pinky and Rusty, who were feral when adopted by Joyce in 1997. They have many tender moments together, (like this one! ), and have calmed down a lot. Joyce says, "Thanks for these two angels!"